The Toxic Tour of Lake Apopka, led by Jeanne Economos of the Farmworker Association of Florida, shared the deep history of Lake Apopka’s North Shore, agriculture, and nutrient pollution. This synopsis of the Toxic Tour experience gives us a snapshot into systems of pollution and the beginning of a long road to environmental justice. This is what I learned. It all started in the 1940s when the United States government was seeking land for agricultural purposes to assist in providing food to troops during World War II. The north shore of Lake Apopka, located in Central Florida, became the target, amounting to about 20,000 acres of the land converted for agricultural purposes. Farmers built pumps, dikes, and levees to control the flooding and draining of this farmland. The shallow marsh would act as the “kidneys” of the lake which connects to the Ocklawaha River and eventually into the St.Johns River. North Shore farmers would flood the fields in the summertime, to prevent soil oxidation and increase weed control, and drain the land during the Fall, Winter, and Spring to engage in agriculture. The result was a system of flooding and draining that amounted to tons of chemical fertilizers, pesticides, insecticides, and other nutrient high substances flowing into the lake for over 50 years. In the 50s and 60s, Lake Apopka was a huge tourist destination and a bass fishing mecca. Fish camps, hotels, and local businesses supported an eco-tourism economy. Yet with the agricultural operations, the nutrient pollution led to full-scale algae blooms and eutrophication. Eutrophication is defined by as “the process by which a body of water becomes enriched in dissolved nutrients (such as phosphates) that stimulate the growth of aquatic plant life usually resulting in the depletion of dissolved oxygen”(Merriam-Webster). With the lack of oxygen in the water and decrease of aquatic plant photosynthesis, the lake’s ecosystem began to collapse as well as the eco-tourism industry. What was left was the “pea soup” water full of contaminants. City, county, and local officials worked endlessly to try to mitigate the problem. The heat was on to try to save Lake Apopka. Dredging, constructing holding ponds, and other activities were all proposed solutions, each having their own set of limiting factors. Some of the north shore farms tried to mitigate the problem as well. Duda Farms created a retention pond to hold the water in attempts to collect phosphorus before releasing into the lake. Zellwood Farms tried alum treatment, sending water into alum treatment plants to bind phosphorus before releasing back into the lake but this process didn’t work on the dissolved phosphorus. The issue pursued. In the 1980s, a scientist from the University of Florida named Lou Guillette studied the comparison between Lake Woodruff and Lake Apopka alligator populations. What he found was that in Lake Apopka, alligators had low rates of reproduction, males with high estrogen levels, females with high testosterone levels, reproductive-related malformations, birth defects, and other distinctive issues that spoke to the severity of the pollution crisis. Another discovery of Guillette’s was the operation of Tower Chemical Company, a chemical company that operated near the headwaters of Lake Apopka, who mixed and distributed chemical pesticides like DDT. In 1979, there was a spill of pesticides into a holding pond that went into Lake Apopka. The investigation revealed that the exposure of these animals to organochlorine (the class associated with these pesticides) caused the reproductive problems with the alligators. His findings were ill-received at the time but all over the United States similar studies were being conducted regarding DDT and ecosystems. Endocrine disruption was discovered as the scientific explanation for the reproductive issues in these animals which alters organism’s hormone systems, causing cancer, birth defects, and disorders. A scientific backing to Guillette’s argument gave him the credibility and support in the lake clean up efforts. All while the public urged for lake beautification for outdoor activities and a regeneration of eco-tourism. 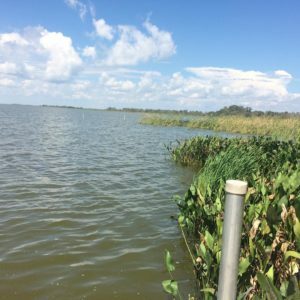 In the 1990s, after decades of attempts to mitigate the lake clean up, The State of Florida passed the Lake Restoration Act. As a result, on May 31st, 1998 many of the farms were shut down in an effort to restore the lake back into its natural state. That fall season, the farmland was flooded. Birds flocked to this area and fished in the shallow waters of the north shore. When Christmas came, the Audubon Society’s winter bird count came up devastatingly short. It was the worst bird death ever recorded in the United States. Thanks to two men from the US Fish and Wildlife service, they found out that the culprit behind the loss in avian life was due to organochlorine pesticides. Even though this class of pesticides was banned in the 60s and 70s, bird life on Lake Apopka was still being affected. Persistent organic pollutants take an extended period of time to break down and can bio-accumulate in organic organisms for decades. Not only bird, fish, and alligator lives were affected, but the health and wellness of the Lake Apopka residents and farm workers were harmed by the toxic pollution as well. Thousands of farm workers worked day after day to cultivate and harvest crops laden with chemical pesticides. Men and women would experience direct contact with the pesticides on the fields and children would be affected as well in the process. This created a huge health risk to this population of people. With so much public attention to the toxicity of the wildlife, soil, and water, the low-income farm workers, equally exposed and at risk, were not given the same attention. Jeanne Economos of the Farmworker Association of Florida experiences stories of toxicity affecting these farm workers everyday in her work as the Pesticides Coordinator. She shares that “because the people on Lake Apopka were low-income farm workers, mostly Haitian, African American and Hispanic, there has been no concerted effort to look at the health effects of these people”. Since organochlorine pesticides bio accumulate, they affect succeeding generations of these families. Illnesses from lupus to cancer have been found in the health history of many families of this area, which are archived as recorded interviews led by the Farmworker Association. Economos urges that a study, specific to this area of Apopka, focusing on the farmworkers who have lived and worked in this area, could produce important information to the exposure of these chemicals and how it affects their health over time. To experience the Toxic Tour and to learn more about the environmental and agricultural history of the North Shore of Lake Apopka, contact the Farmworker Association of Florida’s Apopka office. Person. “Lake Apopka Toxic Tours – Farm Worker Association of Florida, Farm Workers, Florida, Pesticides -.” YAYA, YAYA, 27 Nov. 2012, nfwm-yaya.org/2008/01/lake-apopka-toxic-tours/.